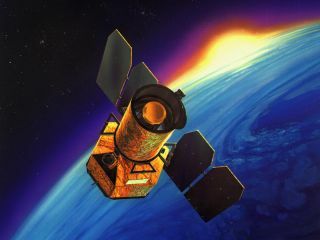 NASA is lending the Galaxy Evolution Explorer (Galex) ultraviolet space telescope to the California Institute of Technology (Caltech) in Pasadena, which intends to put the 9-year-old spacecraft back into service using private funds. NASA and Caltech on Monday (May 14) signed a Space Act Agreement that clears the way for Caltech to take over management and operations of the $150 million space telescope. "NASA sees this as an opportunity to allow the public to continue reaping the benefits from this space asset that NASA developed using federal funding," NASA Astrophysics Division Director Paul Hertz said in a statement. "This is an excellent example of a public/private partnership that will help further astronomy in the United States." Launched aboard an Orbital Sciences Corp. Pegasus XL rocket in April 2003 on a two-and-a-half-year mission to measure the history of star formation, the Orbital-built telescope was finally placed in standby mode this past February after it failed to make the cut of operating missions seeking continued funding. Chris Martin, the Caltech-based principal investigator for Galex, said his team currently has four partners that together will fund about five months of operations. The Keck Institute for Space Studies at Caltech has committed to fund the first month of operations. A group of Israeli universities led by the Weizmann Institute of Science near Tel Aviv will fund two full months of operations. Cornel University in Ithaca, N.Y., will cover another month, and a large international consortium called GAMA/Herschel-Atlas/DINGO will cover a little less than a month. "We are actively looking for new sources of funding, both from similar kinds of entities as well as philanthropic organizations and private donors," Martin said in an interview. Martin also said he "would be absolutely open" to corporate sponsorship. While $100,000 a month is not exactly chump change, Martin characterized it as a bargain for an observatory with Galex’s capabilities. "There’s always pressure to have the highest possible science per dollar," he said. "We are in the relatively unique position in that we are very low cost to operate and there’s enormous science impact for the additional data." Dulles, Va.-based Orbital Sciences will continue performing flight control functions for Caltech associated with monitoring and commanding Galex and participating in mission planning, NASA said in a press release announcing the agreement. Universal Space Network of Newport Beach, Calif., will continue providing ground stations for communicating with the spacecraft. Martin said both companies will continue to be paid for their services. "They’ve tried very hard to make their costs as minimal as possible," he said. Caltech plans to use Galex to serve its partner organizations' objectives, starting with completing an all-sky survey of our Milky Way galaxy— a job that Martin said was about 85 percent done when NASA decided to pull the plug. The group will also use Galex to study how stars and galaxies change over time and make deep observations of the stars being surveyed for orbiting planets by NASA’s planet-hunting Kepler space telescope. The resulting data will be made available to the public. NASA also said that the agency maintains ownership and liability for the spacecraft. When Caltech completes science activities, the university will be responsible for decommissioning the spacecraft for NASA. The spacecraft’s batteries and solar panels are expected to hold out for at least three more years, Harrington said. The 617-pound (280-kilogram) spacecraft itself is expected to remain in orbit for at least 66 years, after which it will re-enter Earth’s atmosphere and burn up.